Jake and Allie met at the ripe old age of six. They grew up in Ashburnham, MA and developed a love for farming at their summer jobs. They moved to the city and got married, their careers (in law enforcement and fitness) leading them away from the pastoral life; they dreamed of someday retiring on a “small farm.” They were successful and happy yet found themselves yearning for a more meaningful way of life. Mr. Smith received a phone call that night from two perfect strangers: very excited and very inexperienced “farmers” interested in buying the farm. Well, the rest is history…The Smiths taught the Catlins how to make cheese and care for the cows on weekends for over a year before the sale was official. Together with Jake’s brother Mike and wife Leah, their family has grown by 200 Holsteins, 43 acres, and more wheels of cheese than a connoisseur can dream of. It’s hard work but it’s meaningful work-Jake and Allie are thankful every day that they made that phone call. 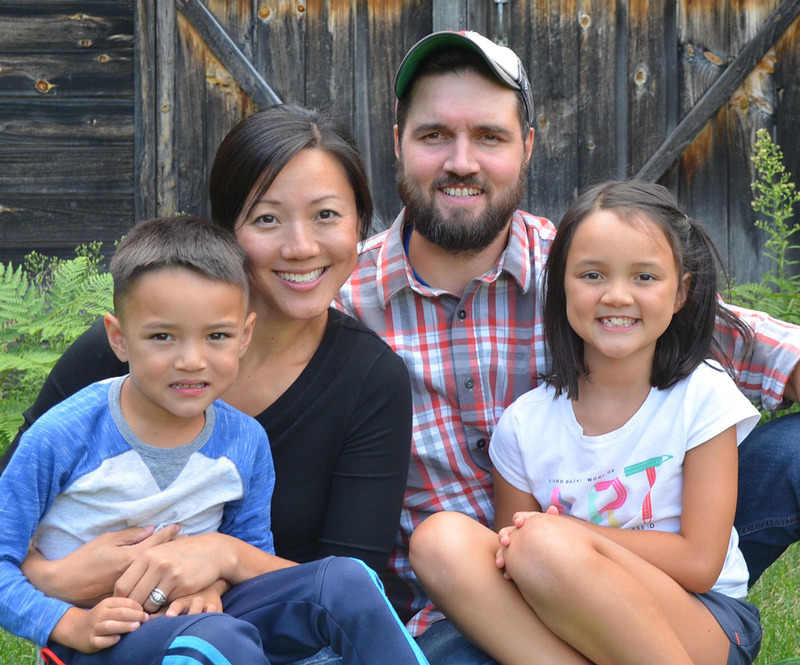 Big city college Program Advisor and inner-city kindergarten teacher doesn’t usually equal dairy farmers, but Mike and Leah Catlin (Oakmont High School sweethearts), with their two young children, celebrate their unconventional foray into farming. After graduating from Ithaca College, Mike and Leah spent the next decade growing and raising their family and cultivating careers outside of Atlanta, but always felt like something was missing. In the summer of 2015 Jake and Allie’s simple question became the answer: “Do you guys want to be dairy farmers and make cheese with us?” With a dormant passion realized, the Georgia Catlins made the big moo-ve home to Massachusetts and have embraced their new farm life (and love how they look in coveralls and muck boots). Jake and Allie Catlin with their children Samantha and Sadie. Mike and Leah Catlin with their children Michael and Finley.